^ Dawn Mission: Search 互联网档案馆的存檔，存档日期2016-03-05. ^ 5.0 5.1 5.2 5.3 5.4 JPL Small-Body Database Browser: 4 Vesta. [2008-06-01]. ^ AstDyS-2 Vesta Synthetic Proper Orbital Elements. Department of Mathematics, University of Pisa, Italy. [2011-10-01]. ^ Harris, A. W.; Warner, B. D.; Pravec, P.; (Eds.). Asteroid Lightcurve Derived Data. EAR-A-5-DDR-DERIVED-LIGHTCURVE-V8.0.. NASA Planetary Data System. 2006 [2013-12-26]. （原始内容存档于2007-01-28）. ^ 9.0 9.1 Tedesco, E. F.; Noah, P. V.; Noah, M.; Price, S. D. Infra-Red Astronomy Satellite (IRAS) Minor Planet Survey. 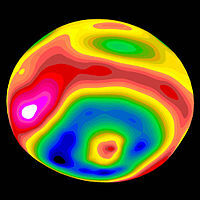 IRAS-A-FPA-3-RDR-IMPS-V6.0.. NASA Planetary Data System. 2004 [2007-03-15]. （原始内容存档于2007年3月11日）. ^ 10.0 10.1 Mueller, T. G.; Metcalfe, L. ISO and Asteroids (PDF). European Space Agency (ESA) bulletin. 2001, 108: 38. ^ Neese, C.; Ed. Asteroid Taxonomy EAR-A-5-DDR-TAXONOMY-V5.0. NASA Planetary Data System. 2005 [2013-12-25]. （原始内容存档于2006年9月5日）. ^ Menzel, Donald H.; and Pasachoff, Jay M. A Field Guide to the Stars and Planets 2nd. Boston, MA: Houghton Mifflin. 1983: 391. ISBN 0-395-34835-8. ^ NASA – Dawn at a Glance. NASA. [2011-08-14]. ^ Shiga, David. Dawn captures first orbital image of asteroid Vesta. New Scientist. [2011-08-07]. ^ Amos, Jonathan. Vesta rock turns for Dawn probe. BBC Online. BBC News. 2011-07-22 [2011-08-14]. （原始内容存档于2011年7月28日）. ^ Kremer, Ken. Dawn Spirals Down Closer to Vesta’s South Pole Impact Basin. Universe Today. 2011-07-23 [2011-08-14]. ^ Space Telescope Science Institute. Hubble 2008: Science year in review. NASA Goddard Space Flight Center. 2009: 66. ^ 20.0 20.1 Pitjeva, E. V. High-Precision Ephemerides of Planets—EPM and Determination of Some Astronomical Constants (PDF). Solar System Research. 2005, 39 (3): 176. Bibcode:2005SoSyR..39..176P. doi:10.1007/s11208-005-0033-2. ^ 21.0 21.1 Savage, Don; Jones, Tammy; and Villard, Ray. Asteroid or Mini-Planet? Hubble Maps the Ancient Surface of Vesta. Hubble Site News Release STScI-1995-20. 1995 [2006-10-17]. ^ A look into Vesta’s interior. Max Planck Society. 2011-01-06 [2011-01-07]. ^ Jutzi, M.; E. Asphaug; P. Gillet; J.-A. Barrat; W. Benz. The structure of the asteroid 4Vesta as revealed by models of planet-scale. Nature. 2013-02-14, 494: 207–210 [2014-04-30]. Bibcode:2013Natur.494..207J. doi:10.1038/nature11892. ^ Cook, Jia-Rui. Dawn Reality-Checks Telescope Studies of Asteroids. [2014-04-30]. （原始内容存档于2014年5月2日）. ^ McSween, H. Y.; R. P. Binzel; M. C. De Sanctis; E. Ammannito; T. H. Prettyman; A. W. Beck; V. Reddy; L. Le Corre; M. J. Gaffey; 等. Dawn; the Vesta-HED connection; and the geologic context for eucrite, diogenites, and howardites. Meteoritics & Planetary Science. 2013-11-27, 48 (11): 2090–21–4 [2014-04-30]. Bibcode:2013M&PS...48.2090M. doi:10.1111/maps.12108. ^ 27.0 27.1 M. S. Kelley et al Quantified mineralogical evidence for a common origin of 1929 Kollaa with 4 Vesta and the HED meteorites, Icarus, Vol. 165, p. 215 (2003). ^ Vesta. NASA/JPL. 2011-07-12 [2011-07-30]. （原始内容存档于2011年6月29日）. 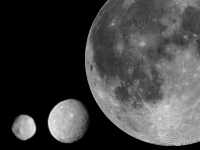 ^ Ceres, Pallas, Vesta, and Hygiea. Gravity Simulator. [2008-05-31]. （原始内容存档于2008年6月17日）. ^ Ammannito, E.; M. C. De Sanctis; E. Palomba; A. Longobardo; D. W. Mittlefehldt; H. Y. McSween; S. Marchi; M. T. Capria; F. Capaccioni; 等. Olivine in an unexpected location on Vesta's surface. Nature. 2013-11-06, 504: 122–125. Bibcode:2013Natur.504..122A. doi:10.1038/nature12665. ^ Cook, Jia-Rui. 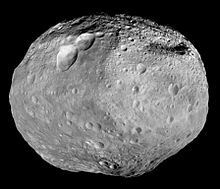 It's Complicated: Dawn Spurs Rewrite of Vesta's Story. [2014-04-30]. （原始内容存档于2014年5月2日）. ^ Littmann, Mark. Planets Beyond: Discovering the Outer Solar System. Dover Books on Astronomy (Courier Dover Publications). 2004: 21. ISBN 0-486-43602-0. ^ Lynn, W. T. The discovery of Vesta. The Observatory. February 1907, 30: 103–105. Bibcode:1907Obs....30..103L. ^ Dunnington, Guy Waldo; Gray, Jeremy; Dohse, Fritz-Egbert. Carl Friedrich Gauss: Titan of Science. The Mathematical Association of America. 2004: 76. ISBN 0-88385-547-X. ^ Rao, K. S.; Berghe, G. V. Gauss, Ramanujan and Hypergeometric Series Revisited. Historia Scientiarum. 2003, 13 (2): 123–133. ^ Schmadel, Lutz D. Dictionary of Minor Planet Names: Prepared on Behalf of Commission 20 Under the Auspices of the International Astronomical Union. Springer. 2003: 15. ISBN 3-540-00238-3. ^ von Zach, Franz Xaver. Monatliche correspondenz zur beförderung der erd- und himmels-kunde, Volume 15. 1807: 507. ^ Carlini, Francesco. Effemeridi astronomiche di Milano per l'anno 1809. 1808. ^ Bureau des longitudes. Annuaire pour l'an 1808. 1807: 5. ^ Canovai, Stanislao; del-Ricco, Gaetano. Elementi di fisica matematica. 1810: 149. ^ Wells, David A.; Bliss, George, Jr.; (Eds.). The Planet Hygiea. Annual of Scientific Discovery for the year 1850, quoted by spaceweather.com archives, 2006-09-13. 1851 [2008-06-01]. ^ From Dr. James Hilton's When Did the Asteroids Become Minor Planets?, particularly the discussion of Gould, B. A. 1852, On the Symbolic Notation of the Asteroids, Astronomical Journal, Vol. 2, and immediately subsequent history. The discussion of C. J. Cunningham (1988), also from there, explains the parenthetical part. ^ Hughes, D. W. The Historical Unravelling of the Diameters of the First Four Asteroids. Quarterly Journal of the Royal Astronomical Society. September 1994, 35 (3): 331. Bibcode:1994QJRAS..35..331H. ^ Povenmire, H. The January 4, 1991 Occultation of SAO 93228 by Asteroid (4) Vesta. Meteoritics & Planetary Science. September 2001, 36 (Supplement): A165. Bibcode:2001M&PSA..36Q.165P. ^ Hertz, Hans G. Mass of Vesta. Science. 1968-04-19, 160 (3825): 299–300. Bibcode:1968Sci...160..299H. PMID 17788233. doi:10.1126/science.160.3825.299. ^ Kovačević, A. Determination of the mass of (4) Vesta based on new close approaches. Astronomy and Astrophysics. January 2005, 430 (1): 319–325. Bibcode:2005A&A...430..319K. doi:10.1051/0004-6361:20035872. ^ Older form and discussion of its complexity from Gould, 1852 (Gould, B.A. 1852, On the Symbolic Notation of the Asteroids, Astron. J., 2, as cited and discussed here 存档副本. [2006-05-20]. （原始内容存档于2006-05-20）. .
^ O. Gingerich. The Path to Defining Planets (PDF). Harvard–Smithsonian Center for Astrophysics and IAU EC Planet Definition Committee chair. 2006 [2007-03-13]. （原始内容存档 (PDF)于2007年3月6日）. ^ 51.0 51.1 Baer, James; Chesley, Steven R. Astrometric masses of 21 asteroids, and an integrated asteroid ephemeris (PDF). Celestial Mechanics and Dynamical Astronomy (Springer Science+Business Media B.V. 2007). 2008, 100 (2008): 27–42 [2008-11-11]. Bibcode:2008CeMDA.100...27B. doi:10.1007/s10569-007-9103-8. ^ Fu, R. R.; Hager, B. H.; Ermakov, A.I. ; Zuber, M.T. Early Viscous Relaxation of Asteroid Vesta and Implications for Late Impact-Driven Despinning (PDF). 44th Lunar and Planetary Science Conference. 2013: 2115. ^ Asmar, S. W.; Konopliv, A. S.; Park, R. S.; Bills, B. G.; Gaskell, R.; Raymond, C. A.; Russell, C. T.; Smith, D. E.; Toplis, M. J.; Zuber, M. T. The Gravity Field of Vesta and Implications for Interior Structure (PDF). 43rd Lunar and Planetary Science Conference. 2012: 2600. ^ 57.0 57.1 David A. Williams, R. Aileen Yingst, W. Brent Garry. Introduction: The geologic mapping of Vesta. Icarus: 1–12. [2018-04-02]. doi:10.1016/j.icarus.2014.03.001. ^ Jennifer E.C. Scully, A. Yin, C.T. Russell, D.L. Buczkowski, D.A. Williams, D.T. Blewett, O. Ruesch, H. Hiesinger, L. Le Corre, C. Mercer, R.A. Yingst, W.B. Garry, R. Jaumann, T. Roatsch, F. Preusker, R.W. Gaskell, S.E. Schröder, E. Ammannito, C.M. Pieters, C.A. Raymond. Geomorphology and structural geology of Saturnalia Fossae and adjacent structures in the northern hemisphere of Vesta. Icarus: 23–40. [2018-04-02]. doi:10.1016/j.icarus.2014.01.013. ^ Michael Schäfer, Andreas Nathues, David A. Williams, David W. Mittlefehldt, Lucille Le Corre, Debra L. Buczkowski, Thomas Kneissl, Guneshwar S. Thangjam, Martin Hoffmann, Nico Schmedemann, Tanja Schäfer, Jennifer E.C. Scully, Jian-Yang Li, Vishnu Reddy, W. Brent Garry, Katrin Krohn, R. Aileen Yingst, Robert W. Gaskell, Christopher T. Russell. Imprint of the Rheasilvia impact on Vesta – Geologic mapping of quadrangles Gegania and Lucaria. Icarus: 60–73. [2018-04-02]. doi:10.1016/j.icarus.2014.06.026. ^ T. Kneissl, N. Schmedemann, V. Reddy, D.A. Williams, S.H.G. Walter, A. Neesemann, G.G. Michael, R. Jaumann, K. Krohn, F. Preusker, T. Roatsch, L. Le Corre, A. Nathues, M. Hoffmann, M. Schäfer, D. Buczkowski, W.B. Garry, R.A. Yingst, S.C. Mest, C.T. Russell, C.A. Raymond. Morphology and formation ages of mid-sized post-Rheasilvia craters – Geology of quadrangle Tuccia, Vesta. Icarus: 133–157. [2018-04-02]. doi:10.1016/j.icarus.2014.02.012. ^ Rheasilvia – Super Mysterious South Pole Basin at Vesta is Named after Romulus and Remus Roman Mother. Universe Today. 2011-09-21 [2011-09-23]. ^ IAU. Planetary Names Target: Vesta. ^ Buczkowski, Debra. Large-scale troughs on Vesta: A signature of planetary tectonics. ^ Buczkowski, Debra; Raymond, C. A.; Williams, D. A.; Schenk, P. M.; Roatsch, T.; Preusker, F.; Jaumann, R.; Gaskell, R. W.; Yingst, R. A.; Mest, S.; Garry, W. B.; Reddy, V.; Nathues, A.; Le Corre, L.; Russell, C. T.; Scully, J. E.C. ; Wyrick, D. Y.; Barnouin, O. S.; Kahn, E. G.; Iyer, K. A. Asteroid's troughs suggest stunted planet. Large-scale troughs on Vesta: A signature of planetary tectonics. American Geophysical Union. [2012-11-25]. （原始内容存档于2012年10月31日）. ^ B. J. Zellner et al Hubble Space Telescope Images of Asteroid Vesta in 1994, Icarus, Vol. 128, p. 83 (1997). ^ The interior of asteroid Vesta. [2011-01-06]. ^ Ghosh, A.; McSween, H. Y. A Thermal Model for the Differentiation of Asteroid 4 Vesta, Based on Radiogenic Heating. Icarus. 1998, 134 (2): 187. Bibcode:1998Icar..134..187G. doi:10.1006/icar.1998.5956. ^ Righter, K.; Drake, M. J. A magma ocean on Vesta: Core formation and petrogenesis of eucrites and diogenites. Meteoritics & Planetary Science. 1997, 32 (6): 929–944. Bibcode:1997M&PS...32..929R. doi:10.1111/j.1945-5100.1997.tb01582.x. ^ Drake, M. J. The eucrite/Vesta story. Meteoritics & Planetary Science. 2001, 36 (4): 501–513. Bibcode:2001M&PS...36..501D. doi:10.1111/j.1945-5100.2001.tb01892.x. ^ Sahijpal, S.; Soni, P.;Gagan, G. Numerical simulations of the differentiation of accreting planetesimals with 26Al and 60Fe as the heat sources. Meteoritics & Planetary Science. 2007, 42 (9): 1529–1548. Bibcode:2007M&PS...42.1529S. doi:10.1111/j.1945-5100.2007.tb00589.x. ^ Gupta, G.; Sahijpal, S. Differentiation of Vesta and the parent bodies of other achondrites. J. Geophys. Res. (Planets). 2010, 115 (E8): E08001. Bibcode:2010JGRE..11508001G. doi:10.1029/2009JE003525. ^ H. Takeda Mineralogical records of early planetary processes on the HED parent body with reference to Vesta, Meteoritics & Planbetary Science, Vol. 32, p. 841 (1997). ^ Ulivi, Paolo; Harland, David. Robotic Exploration of the Solar System: Hiatus and Renewal, 1983–1996. Springer Praxis Books in Space Exploration. Springer. 2008: 117–125. ISBN 0-387-78904-9. ^ Mid-continent Research for Education and Learning: McREL. Dawn Mission: Mission. Dawn Journal. 2010-09-27 [2011-03-29]. ^ Jia-Rui C. Cook, Dwayne C. Brown. NASA's Dawn Captures First Image of Nearing Asteroid. NASA/JPL. 2011-05-11 [2011-05-14].